Posted April 18, 2016, 7:58 p.m.
Posted Feb. 5, 2016, 3:11 p.m.
Posted Nov. 7, 2015, 3 a.m.
Posted Nov. 20, 2015, 4:46 p.m.
Posted Nov. 20, 2015, 4:49 p.m. The fear in the Montecito Heights neighborhood of Los Angeles lingered long after the grisly discovery last fall of two teenagers killed at Ernest E. Debs Regional Park. Some locals changed their daily routines, avoiding favorite hiking trails or nightly walks. Others stayed away from the popular park altogether. As the months progressed without an arrest, residents would stop and ask Roy Payan, a member of the neighborhood council, what was happening with the investigation.“Are you sure LAPD cares about us?” they asked him. 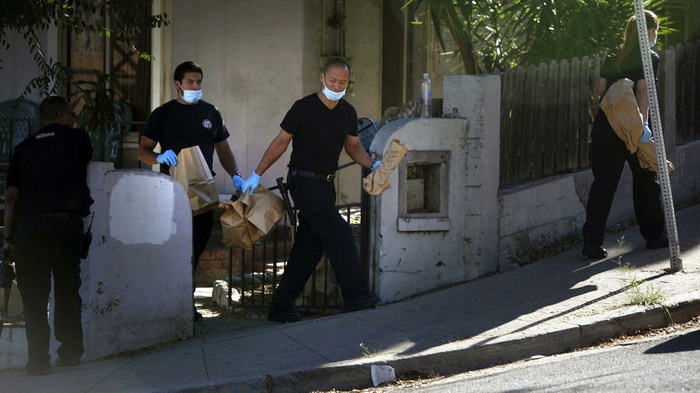 On Thursday, authorities announced a break in the case as Los Angeles County prosecutors charged two accused gang members with carrying out the brutal killings. Prosecutors allege that Dallas Stone Pineda, 17, and Jose Antonio Echeverria, 18, killed the two teenagers to further the activities of a gang, according to a complaint filed by the district attorney's office. The murder charges come more than three months after the bodies of Gabriela Calzada, 19, and Briana Gallegos, 17, were found in bushes off a trail in the park. Los Angeles police Chief Charlie Beck said the women were killed in a “horrific scene.” One victim was shot, he said. Both were bludgeoned, but he declined to say with what. The district attorney's complaint said Echeverria used a rifle to kill Calzada. Investigators, Beck said, believe no other people were directly involved in the killings. Authorities declined to go into further detail about a motive for the crime or how the suspects knew the teenagers. Shortly after a woman discovered the bodies on Oct. 28, an uneasiness permeated the neighborhood. Residents gathered at community meetings, questioning whether they were safe. Some feared a serial killer was on the loose, a rumor police quickly tried to dispel. Detectives remained tight-lipped, even as residents and reporters watched police search three homes in connection with the case in mid-November. Toward the end of the month, the case was reassigned from Hollenbeck investigators to the LAPD’s Robbery-Homicide Division, which usually investigates high-profile or complex cases. “Literally dozens of detectives were assigned to work this case,” Beck said. Investigators examined forensic evidence and interviewed dozens of people, he said. Echeverria was initially arrested on suspicion of shooting at an occupied vehicle. Prosecutors also charged him with attempted murder, shooting at a car and bringing methamphetamine into a jail. Echeverria used the moniker “Klepto” and Pineda used “Trippy,” prosecutors allege. The district attorney's office said prosecutors would decide later whether to seek the death penalty for Echeverria. Pineda, who is charged as an adult, is ineligible for execution because of his age. If convicted, he faces a maximum sentence of life in prison. Pineda and Echeverria appeared dressed in jail scrubs in a downtown Los Angeles courtroom Thursday afternoon. As Superior Court Judge Sergio C. Tapia ordered them held without bail, a woman in the audience held her hand over her mouth and quietly wept. She declined to comment after the hearing.Tapia delayed an arraignment for the pair until March 8. Arrest records list Echeverria's home on Topaz Street, just blocks from the entrance to the park. On Thursday, a woman who did not identify herself told a reporter through the metal screen door that Echeverria's family was not home. “We have nothing to say,” she said. At the site where the bodies were found, two easels sat along a ditch off an empty trail. Deflated balloons hung from one, which held a photo of Gallegos. On the ground next to the other was a broken photo frame with no photograph. Eric Calderon, 18, who was walking his dog along the trail, said he lives around the corner from where Echeverria resides and was shocked when police searched the home in connection with the killings. “Hopefully they caught the right guy,” he said. Zoyla Perez, 72, who has lived in her home at the foot of the park since 1987, said she was glad police had arrested suspects in the case, but she was saddened — and frightened — to learn one of the men lived nearby. The bodies were found along her favorite walking path, one she now no longer takes. She said she also has stopped leaving her front door open in the evenings for fresh air out of fear of the gunshots she hears at night. Recently, a 25-year-old was shot and killed down the block. Police said he had no gang ties and was simply out with his friends. The mother of the 17-year-old victim said news of the charges did not bring relief. Instead, it was a reminder that her daughter, Briana, was gone. “It brings back so many things,” she said. The mother, who did not want her name published out of concern for her safety, said she doesn't want to get involved in the upcoming court proceedings. “I just want this nightmare to get over,” she said. It is now time to institute Stop and Frisk in high crime hoods. When a particular are reaches a certain percentage per citizen, Stop and Frisk can be legally instituted. Do Something legally. — slickrcc Jan. 5, 2018 at 3:33 a.m.
Have fun in prison you low- lives may you both rot in hell, I wonder where your so-called homies are at now. — Ghost Feb. 7, 2016 at 1:33 a.m. I'm saddened that the police and the community only focused on the two young girls. These girls didn't deserve to die but put themselves in harms way by associating with these types of animals. Don't forget there are other innocent victims who were chosen at random, like my son Adrian on 11-28-2015. Just because there was an arrest doesn't mean this comunity should let there guard down. Sorry to bust your bubble, these senseless killings will not cease until a gang sweep conducted by local and federal authorities is executed. We are not out of danger yet. So stay away from Rose kills. They target random people. — Ariel posueloz Feb. 5, 2016 at 11:03 p.m.